So, on that note, more triangles are being cut out for one more row. Some striped fabric was auditioned for the border, but I'm not sold on it yet. Now, I have been asked about my triangle pattern. Where can you get one? My pattern came from my EQ7 program under One Patch. It is really a hexagon that has been sectioned off. I simply turned my hexagons into triangles for ease of sewing. If you can't get a hexagon big enough, below is another way that you can make the templates. Once my paper template is ready and cut out, a plastic template will be made that has a good 3/8" seam allowance. I allow extra fabric at the seams which is trimmed later. My plastic template is used for drawing the design onto a piece of fabric. The design is drawn and will be cut out with scissors. A good project for catching up on TV programs. Here are my fabric pieces ready for the paper templates. Paper template pinned in place. See the seams at the top two sides? Just make sure they measure 1/4". The two short edges are folded over and basted in place. This is what it looks like from the front. Take your ruler and line up 1/4" on one long side. Trim. Then do the other side. Sides are trimmed and ready for sewing. 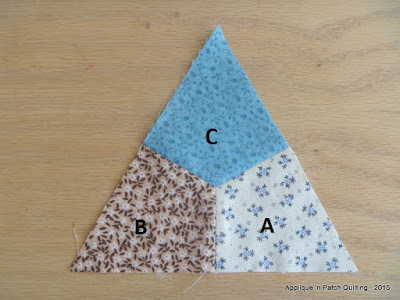 Once you are happy with your placement, it is time to start hand sewing triangles together. This is what the front looks like. This is what the back looks light. If you follow the directions for making your own triangle template, your side should measure 6". The smaller arrows show the seams sewn together. At this point, all the basting and paper templates are removed. 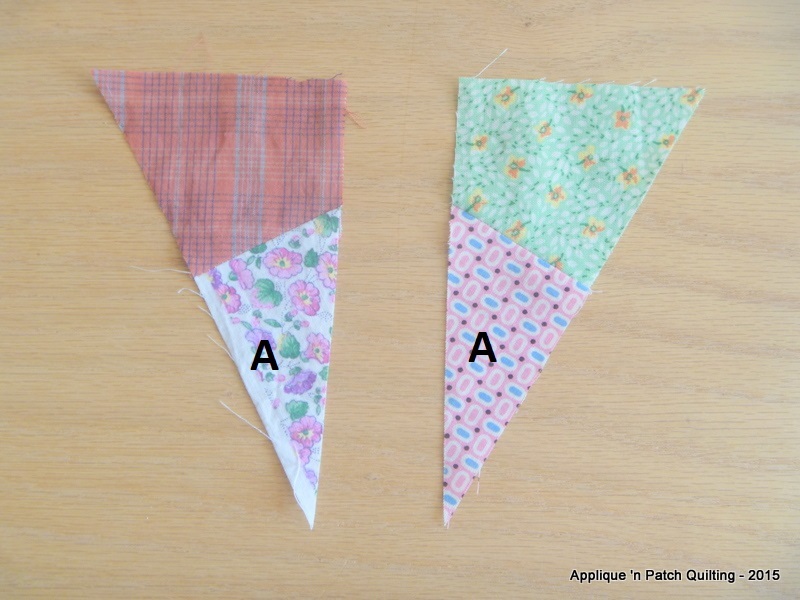 You will need some half triangles to finish the sides as shown below. Just take your paper templates and cut in half. You will need to reverse half of your side templates to get an even edge. 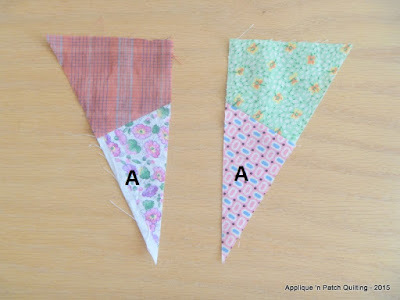 Once your triangles are hand sewn together, then it is time to start sewing those triangles together. This is my system of marking my triangles for sewing so that none of the triangles get messed up. Trust me, it really is easy to twist those triangles around, even when you mark them. This is what one row looks like all sewn together. Happy days! So, back to cutting and basting to get that last row done. Hmmmm......not sure that I am sold on that border fabric either......but your decisions always work, so it will be interesting to see what is chosen! Thanks for showing how you accomplished your triangles--it's such an awesome quilt! 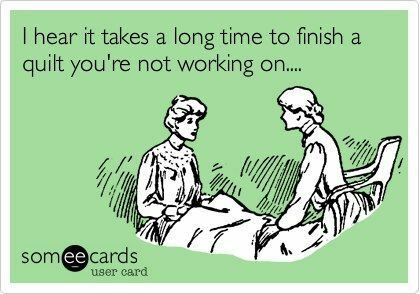 I'm looking forward to seeing it finished.